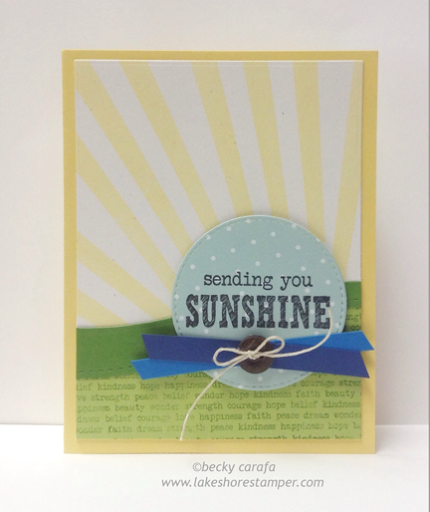 I made this cheerful card for my Clearly Whimsy stamps card of the week. I stamped the sun rays (Up Up and Away) in light yellow on a white panel. I stamped the text background (Basic Backgrounds & Borders) on a light green panel and attached a swoopy strip that I cut using the Stitched Border dies. I cut a circle of patterned paper and stamped the sentiment on it (Up Up and Away Additions). I added two simple strips of blue cardstock and a button to finish off the sentiment layer. So sweet! Love the colors with that great sunshine.